Sports betting has become a hot topic in the United States over the years. The surge in popularity has exposed the industry as a way of fan engagement and the amount of money invested in it annually reveals its potential for an economic booster. Despite the interest surrounding sports betting, it isn’t wholly embraced nationwide, making it difficult for the industry to gain the right traction. That could be changing soon, as more states and even the major professional sports leagues are opening up to the idea of having a legal, regulated sports gambling market. Technically, not unless you live in Oregon, Delaware, Montana or Nevada. However, residents of the other 46 states can still place bets through legally sanctioned online sportsbooks. There are several federal laws that ban sports gambling in the US, and each state has their own laws regarding the matter. Once you understand how the laws affect sports betting, you’ll know how to safely and legally place bets online. These laws are explained in greater detail further down the page. There are a lot of online sportsbooks to choose from. With so many options, sometimes it can be difficult figuring out which sports gambling sites are legitimate. Our team of industry professionals have vetted each of these sportsbooks and list several that we deem to be the most reputable and legitimate in the industry. When checking for legitimacy, we look to see if these sportsbooks have the necessary legal licensing and regulatory oversight, proper security protocols, fast payouts, added features like bonuses and live/mobile betting and have quality betting lines available. You can access the online sportsbooks best suited to USA bettors in our table below. The first (and main) law concerning sports gambling in the US is called the Professional and Amateur Sports Protection Act, or PASPA. This law was passed in 1992 and effectively bans sports betting in 46 states—the only exempted states are the ones mentioned in the introduction. Under PASPA, these 46 states cannot host state-sponsored sports betting (through the Lottery, for example) or have physical sportsbook locations. The Federal Wire Act is another law that influences US sports betting. It blocks interested bettors from placing bets online via illegal US-based sportsbooks. With the emergence of more online entertainment, such as online poker or casino games, the law’s reach became a little cloudy. This prompted the Department of Justice to issue a Formal Opinion in 2011 that clarified the law strictly applies to state-based sports betting, allowing states to have other forms of online gambling should they choose to do so. This law doesn’t make it illegal to place sports bets online, just with US-based sportsbooks. The online sportsbooks we’ve suggested are offshore and legally licensed and regulated by their own government. The last major federal law affecting USA sports betting is the Unlawful Internet Gambling Enforcement Act (UIGEA). This law applies directly to banks and other financial institutions and how they process transactions accrued through online gambling. Its sole purpose is to provide regulatory oversight to banks, not the individual bettors that do business with these sites. Furthermore, the UIGEA doesn’t make it illegal to place bets online, it just establishes strict protocols in regards to how funds are exchanged between parties. This law would make it illegal for US-based sportsbooks to accept any sort of deposits or issue any payouts, thus reinforcing the common theme with all of these laws—US-based sportsbooks are illegal; not the offshore sportsbooks we’ve recommended. The offshore sportsbooks outlined in this guide are outside the jurisdiction of United States federal law. You can learn more about each of these federal regulations on our page dedicated to sports gambling laws in the US. Most states have something in their laws about sports betting being illegal, at least in physical sportsbooks. However, some states have begun pushing legislation that would allow for legalized sports betting on a state level. Their efforts have all been stalled by PASPA and nothing serious can change in regards to legalization until PASPA is either amended or repealed. New Jersey has been the most aggressive state in this pursuit, signing legislation into law that circumvents PASPA. They have also been stalled by lawsuits and other bureaucratic actions and are waiting to see if their case will be heard by the Supreme Court. The other states that have put bills into the legislative circuit are all hinging on PASPA’s repeal. Regardless, it shows an interest in legalizing sports gambling that could stir some changes. Washington is an outlier in the world of legalized sports betting, as they have a state law that permits sports pools. Their law also dictates that online sportsbooks (even the legally sanctioned offshore ones) are illegal and WA residents cannot place bets or receive any money from winnings through these sites. Other than WA, no other state has laws with any sort of legal bearing on placing bets with offshore sportsbooks. Where Can Individuals in the US Legally Place Bets on Sports? 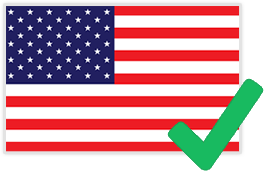 It depends on which state you live in, however most US residents have the option of betting via offshore sportsbooks. These sportsbooks are all legally sanctioned and regulated. Because they are offshore, they are unaffected by US state and federal law. Sportsbook bonuses are what separate these offshore sportsbooks from the typical ones you’d find in Las Vegas. These bonuses are essentially “free money” that is added to your sportsbook account. For example, most sportsbooks will add on a percentage to your first deposit as a welcome bonus—these percentages can vary depending on the site. There are other bonuses, like Refer-A-Friend bonuses and promotional bonuses, that provide incentives to keep gambling. Bonuses are offered throughout the year, so there is always something extra for you to cash in on. What Kind of Sports Can I Bet On At US Online Sportsbooks? These offshore sportsbooks have a wide range of betting lines available from leagues around the world. You can bet on football, soccer, basketball, baseball, hockey, boxing/MMA matches, stock car races, horse races and more. There are also betting lines for college-level sports. Sometimes the sportsbook will offer bonuses in accordance with major tournaments, like with March Madness for example. Live betting is one of the most exciting features of sports gambling, as you’re placing bets and potentially winning money in real time. It’s a great way to get more involvement with the sport both from a fan and betting perspective. Sportsbooks have a separate section for live betting and it will show you all the live sports games happening that day. You place your wager like you would with any other bit, tracking it on your bet slip. Live betting rules shift with each sport (as each sport has different rules). These bets usually deal with certain occurrences or non-occurrences happening and are time-sensitive, meaning the bet will expire at some point. You can find the specific live betting rules online as they pertain to each individual sport. Can I Place Sports Bets From My Mobile Phone? Yes. Mobile betting is another feature of these offshore sportsbooks. Instead of downloading an app, all you do is enter the URL into your mobile browser and you’ll be automatically redirected to the mobile version of their site. The mobile versions of these sites have all the same security features and functionalities as the web versions. They are also designed to work across a variety of carriers and devices. You can even access the site via your tablet. Do I Need To Deposit Money Before Browsing the Betting Lines? No. You can look through the site before even making an account if you’d like. This way you can see if the site provides what you’re looking for in terms of available betting lines. Even when you go to make an account, you won’t be asked for any financial information until you’re ready to make a deposit. Deposits can be made directly through the site. However, your deposit options will vary based on the country you’re in. Certain sportsbooks have different options for US bettors. Some examples of deposit methods you could find are credit/debit card, wire transfers and Bitcoin, to name a few. The payout procedure follows a similar protocol, with the method(s) varying based on where you’re betting from. Your available options can be found on your sportsbook account page. What Is A Bet Slip? A bet slip is how you track and manage all of your wagers. When you place a bet, you’ll see it pop up on your bet slip. Think of it as like a confirmation page, as you will have to manually confirm your bet via the bet slip. You can also usually see how much you stand to win based on the amount you’ve wagered. Once you confirm your bet, it is considered final. Yes. You can have accounts with as many sportsbooks as you like. By doing this, you’d have access to even more bonuses and betting lines. It also allows you to shop around for the best lines. For example if you already know you want to bet on the Patriots -3 for the Superbowl, you might just find that one of the books has the Pats at -2.5 instead of 3. So naturally it makes sense to bet with the sportsbook that is offering the line in your favor.